A hologram is a flat surface that, under proper illumination, appears to contain a three-dimensional image. A hologram may also project a three-dimensional image into the air—a lifelike image that can be photographed although it cannot be touched. Because they cannot be copied by ordinary means, holograms are widely used to prevent counterfeiting of documents such as credit cards, driver's licenses, and admission tickets. The word hologram comes from the Greek roots holos meaning whole and gramma meaning message. The process of making a hologram is called holography. When a hologram is made, light from a laser records an image of the desired object on film or a photographic plate. There are basically two types of holograms. A reflection hologram is viewed when lit from the front, while a transmission hologram is viewed by shining a light through it from the back side. An embossed hologram is made by backing a transmission hologram with a mirror-like substance, which allows it to be viewed when lit from the front. Holograms can also be made that show moving objects; these sequences, called stereograms, are typically three to 20 seconds long. Although a hologram is a visual image of a physical object, it is quite different from a photograph. For instance, when an object is photographed, each portion of the photo contains an image of the corresponding portion of the original object. Each section of a hologram, however, contains a complete image of the original object, viewed from a vantage point that corresponds to the section's position on the hologram. Thus, if the transparent plate containing a transmission hologram is broken, each piece will still be able to project the entire image, albeit from a different point of view. Using a piece from near the top of the holographic plate will produce an image as seen from above, while using a piece from near the bottom of the plate will create the impression of looking upward toward the object. Another interesting property of holograms is that they preserve the optical properties of objects such as lenses. For instance, consider making a hologram of a magnifying glass placed in front of a butterfly. When viewing the holographic image of those objects, an observer will find that the portions of the butterfly seen through the image of the magnifying glass will be enlarged. Holographic packaging has been shown to increase the sales of certain products. Projection holograms are especially eye-catching and are used at trade shows and retail stores. They can be used to display extremely delicate or valuable objects. A classic example was an image of a diamond-adorned hand that was projected over the sidewalk outside the Cartier jewelry store in New York City in 1970. Not only did it catch the attention of people walking by it, it attracted television news crews. In fact, it was even attacked by an umbrella-wielding pedestrian who thought it was the "work of the devil." In another instance, rather than repeatedly handling the fragile skull of the 2,300 year old Lindow Man, researchers studied its holographic image. Scotland Yard's Forensic Science Department used this holographic image to construct a physical model of the remains of the prehistoric man. As yet another application of holography, former Chicago Bears football coach Mike Ditka displayed a holographic portrait of himself in his restaurant to create a somewhat personal image when he could not be there in person. Holograms can be made at home by hobbyists for a modest investment in equipment. The process requires a laser and an isolation table to prevent movement of the equipment while the film is being exposed. Holograms are also produced commercially and can be reproduced in large quantities. Using stock artwork, a master hologram for mass production can be created for as little as $2,500, whereas using custom artwork can cost $5,000 to $10,000. Reproducing the image costs from 1 to 4 cents per inch (2.5 cm), depending on the volume; this represents a 40% decrease since embossed holograms were first marketed in the late 1970s. Finished holograms can be attached to other objects as pressure-sensitive labels (0.5 to 1.5 cents each) or by hot stamping (2 to 5 cents each). Once the artwork is finalized, it takes about three months to create and reproduce a batch of commercial holograms. It is estimated that more than $200 million worth of embossed holograms were manufactured in 1995. The first hologram was made in 1947 by Dennis Gabor, a Hungarian-born scientist who was working at the Imperial College of London. Gabor was attempting to refine the design of an electron microscope. He devised a new technique, which he decided to test with a filtered light beam before trying it with an electron beam. Gabor made a transmission hologram by carefully filtering his light source, but the process did not become practical until technology provided a way to produce coherent light—light that consists of a single frequency and a single wavelength. Hologram production took off with the invention of the laser in 1960, as a laser generates light that is of a single color (frequency) and produces waves that travel in phase with one another. In 1962, using a laser to replicate Gabor's holography experiment, Emmett Leith and Juris Upatnieks of the University of Michigan produced a transmission hologram of a toy train and a bird. The image was clear and three-dimensional, but it could only be viewed by illuminating it with a laser. That same year Uri N. Denisyuk of the Soviet Union produced a reflection hologram that could be viewed with light from an ordinary bulb. A further advance came in 1968 when Stephen A. Benton created the first transmission hologram that could be viewed in ordinary light. This led to the development of embossed holograms, making it possible to mass produce holograms for common use. Nearly a quarter century after he had made the first hologram, Gabor was awarded the Nobel Prize for Physics for this achievement in 1971. The following year, Lloyd Cross made the first recording of a moving hologram by imprinting sequential frames from ordinary moving picture film onto holographic film. Holograms made by individuals are usually exposed on very high resolution photographic film coated with a silver halide emulsion. Holograms made for mass production are exposed on a glass plate pretreated with iron oxide and then coated with photoresist. The photoresist material will chemically react to the specific wavelength of light that will be used to create the hologram. Because of their availability at a relatively low cost, helium-neon lasers are most commonly used by individuals who make their own holograms. Commercial hologram manufacturers use different laser types such as ruby, helium-cadmium, or krypton-argon ion. After exposure, the film or photoresist plate is processed in chemical developers like those used in photography. Both nickel and silver are used to make the production masters that will be used to stamp multiple copies of the holograms onto polyester or polypropylene film. Aluminum is used to create the reflective coating on the back of embossed holograms. Various manuals are available that explain to amateur holographers how to make holograms at home. The following steps describe the commercial mass production of a holographic image of an actual, three-dimensional object. 1 A laser is used to illuminate the physical object, with the reflected light falling on the photoresist plate. Simultaneously, a reference beam from the laser also falls directly on the photoresist plate. The interference patterns of these two light beams react with the photo-sensitive coating to record a holographic image of the object. Common exposure times are between one to 60 seconds. In photography, slight motion of the object or the film results in a blurred image. In holography, however, the exposed plate will be blank (contain no image at all) if during the exposure there is movement as small as one fourth the wavelength of the laser light (wavelengths of visible light range from 400 to 700 billionths of a meter). A typical photoresist plate has a 6 in (15.24 cm) square working area; an extra half-inch (1.25 cm) of space on two edges allows the plate to be clamped into position. Because many holograms are smaller than this, several different images can be "ganged" (clustered) onto one plate, just as numerous individual photographs are exposed on one roll of film. 2 The plate on which the original hologram is recorded is called the master. After being exposed, the master is processed in a chemical bath using standard photographic developers. Before proceeding with production, the master is inspected to confirm that the image has been properly recorded. Because of the chemical reactions caused by the laser and the developer on the photoresist, the developed plate's surface resembles the surface of a phonograph record; there are about 15,000 grooves per inch (600 per cm), reaching a depth of about 0.3 microns (1 micron is a thousandth of a millimeter). deionized water. The thin, nickel coating, which is called the metal master shim, is peeled off the master plate. It contains a negative image of the master hologram (the negative is actually a mirror image of the original hologram). Using similar processes, several generations of shims are created. Those made from the metal master shim are known as "grandmothers," and they contain positive images of the original hologram. At this stage, numerous copies of the original image are "combined" (duplicated in rows) on one shim that can be used to print multiple copies with a single impression. Successive generations of shims are known as "mothers," "daughters," and "stamper shims." Because these generations alternate between negative and positive images of the original, the stamper shims are negative images that will be used during actual production runs to print the final product holograms. 4 Stamper shims are mounted in embossing machines. A roll of polyester film (or a similar material) that has been smoothed with an acrylic coating is run through the machine. Under intense heat and pressure, the shim presses the holographic image onto the film, to a depth of 25 millionths of a millimeter. The embossed film is rewound onto a roll. 5 The roll of embossed film is loaded into a chamber from which the air is removed to create a vacuum. The chamber also contains aluminum wire, which is vaporized by heating it to 2,000°F (1,093°C). The sheet is exposed to the vaporized aluminum as it is rewound onto another roll, and in the process it becomes coated with aluminum. After being removed from the vacuum chamber, the film is treated to restore moisture lost under the hot vacuum condition. A top coating of lacquer is applied to the film to create a surface that can be imprinted with ink. The roll of film, which may be as wide as 92 in (2.3 m), is sliced into narrower rolls. 6 Depending on what type of film was used and what kind of product is being made, one or more finishing steps may be done. For instance, the film may be laminated to paper board to give it strength. The film is also cut into shapes desired for the final product and may be printed with messages. Heat-sensitive or pressure-sensitive adhesive is applied to the back of holograms that will be affixed to other objects or used as stickers. 7 The holograms are either attached to other products or are counted and packaged for shipment. Today, the most common use of holograms is in consumer products and advertising materials. There are some unusual applications too. For example, in some military aircraft, pilots can read their instruments while looking through the windshield by using a holographic display projected in front of their eyes. Automobile manufacturers are considering similar displays for their cars. Holograms can be created without visible light. Ultraviolet, x-ray, and sound waves can all be used to create them. Microwave holography is being used in astronomy to record radio waves from deep space. Acoustical holography can look through solid objects to record images, much as ultrasound is used to generate images of a fetus within a woman's womb. Holograms made with short waves such as x rays can create images of particles as small as molecules and atoms. Holographic television sets may project performers into viewers' homes within the next decade. Fiber optic communications systems will be able to transmit holographic images of people to distant homes of friends for realistic visits. Just as CD-ROM technology used optical methods to store large amounts of computer information on a relatively small disk, three-dimensional holographic data storage systems will further revolutionize storage capacities. It is estimated that this technology will store an amount of information equivalent to the contents of the Library of Congress in a space the size of a sugar cube. Kasper, Joseph E. and Steven A. Feller. The Complete Book of Holograms: How They Work and How To Make Them. John Wiley & Sons, 1987. Saxby, Graham. Practical Holography. Prentice Hall, 1994. Unterseher, Fred, Jeannene Hansen, and Bob Schlesinger. 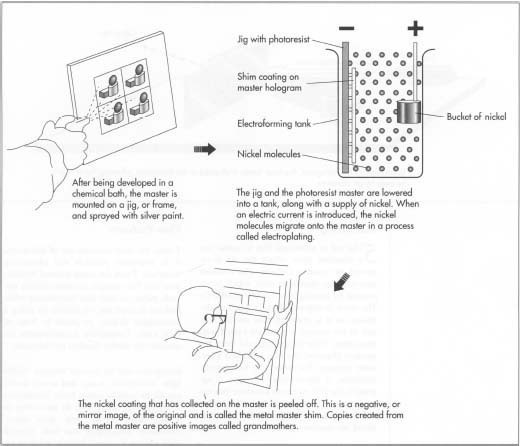 Holography Handbook: Making Holograms the Easy Way. Ross Books, 1996. DeFreitas, Frank. "On-Line Intro. To Holography Lessons." Holostudio. http://www.enter.net/~holostudio/intro.html (7 May 1997). "History and Development of Holography." Holophile, Inc. http://www.connix.com/~barefoot/history.htm (7 May 1997). Holographic Dimensions, Inc. http://www.hmt.com:80/holography/hdi/index.html (7 May 1997). Outwater, Christopher and Van Hamersveld. Practical Holography. http://hmt.com/holography/hdi/holobook.htm (7 May 1997). Pennsylvania Pulp and Paper Co. Prismatic Illusions. http://www.holoprism.com (13 May 1997). My question is that I have two Holographic. My question is are they collectable? I am doing a high school depth study on holograms and was reading through the third paragraph. what is meant when it says a section of the hologram. How much of the plate is included in a section. also when it says a piece of the transmission plate, does that mean a small square of it and if you happen to view the hologram from that angle will you just see nothing because it is broken.